Suminat (Sumatriptan Succinate) is used for the acute symptoms of migraines. It works by acting on the serotonin receptors in the brain. 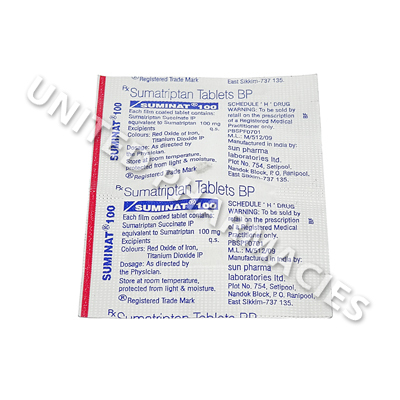 Suminat (Sumatriptan Succinate) is used for the acute symptoms of migraines. It works by acting on the serotonin receptors in the brain. This medicine is a member of the triptan class of medications, and by attaching to and stimulating the serotonin receptors in the brain, it is able to constrict the blood vessels. As a result of this, the throbbing sensation that causes pain in migraines can be treated, and this is how it exhibits its therapeutic benefits in the treatment of migraine. In addition to this, it can also inhibit the release of neuropeptides (substances which can trigger inflammation of the blood vessels). 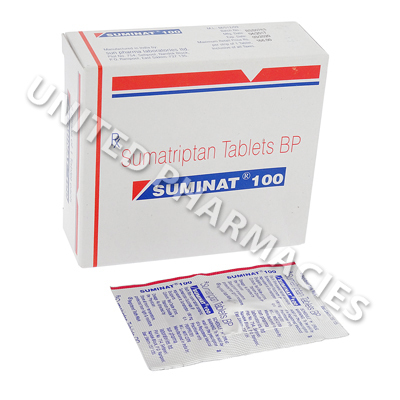 Suminat (Sumatriptan Succinate) is provided as a single 100mg strength tablet for oral administration. Doctors generally advise patients to take it as a single dosage at the onset of a migraine attack. It is not administered for the prevention of attacks, only to treat one that has already commenced. Never take more than the dosage your doctor recommends for you, as this is dangerous. If your migraine does not go away, if it comes back or of you persistently suffer from migraines, see your doctor. You will need to make the doctor providing treatment aware if any side effects occur. Some of the potential reactions may be serious in nature (however, this is a less common occurrence). You will need medical care straight away if you notice seizures, diarrhoea containing blood, numbness, visual disturbances, serious pain occurring in the stomach or any other severe reactions that have not been mentioned here. This medication will only treat headaches that have already commenced. It will not work as a preventative and cannot help to reduce the occurrence of migraine attacks. Do not use this medicine for tension headaches. Only use it for migraine that has been diagnosed by your doctor, and if your doctor has told you to take it. Always use Suminat (Sumatriptan Succinate) as you have been prescribed by your doctor. Never self-medicate or change your dosage without first consulting your doctor. The correct dosage can vary depending on your health, medical history, and the severity of the condition being treated.